After learning that Pirates of the Caribbean: On Stranger Tides director Rob Marshall's stint with the Pirates franchise would end after just one film, Disney went searching high and low for the franchise's successor. 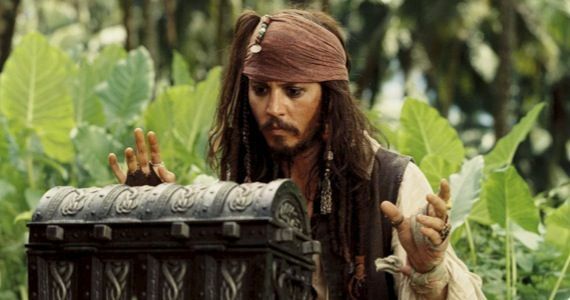 Last month, that search turned a wishlist into a shortlist, and as of Wednesday, the studio has finally decided who it wants to captain Pirates of the Caribbean 5. Deadline is reporting that Disney has selected the Norwegian directing team of Joachim Rønning and Espen Sandberg from a shortlist that also included Fredrik Bond (The Necessary Death of Charlie Countryman) and Rupert Sanders (Snow White and the Huntsman). Though a deal has not been finalized, producer Jerry Bruckheimer and Captain Jack Sparrow himself, Johnny Depp, have approved the directing choice. The duo may not be well known to U.S. audiences, but the fact that they already have one Oscar nomination under their belts - for their 2012 historical drama Kon-Tiki - shows they may be able to steer the Pirates ship in the right direction. Disney also probably liked that the directors have already displayed a knack for shooting on the high seas, as Kon-Tiki chronicled Thor Heyerdal’s 4,300-mile crossing of the Pacific on a balsa wood raft in 1947. Of course, that film was made for almost nothing. This time around - and for the first time in their careers - Rønning and Sandberg will have a major blockbuster budget at their disposal. And since Pirates 5 is expected to be a standalone film, they won't be restricted by previous entries and will (hopefully) be able to use their creative vision to explore new worlds with the franchise. In terms of Pirates 5 becoming a box office hit, ultimately, it may not matter who is at the helm. Marshall's film, On Stranger Tides, was considered by most to be the weakest entry in the series, and yet it brought in $1 billion worth of business worldwide. Though it's unclear how many of those same folks would turn out for the fifth installment, it's likely that a good chunk will be happy to see Captain Jack swashbuckling and drinking rum on the big screen again. With a script in the works, Depp back on board and a directing team secured, it looks like Pirates of the Caribbean 5 is finally ready to set sail. Once Rønning and Sandberg finalize their deal, they will begin prepping the film, which expects to begin production either later this year or early next year. Look for Pirates of the Caribbean 5 when it hits theaters on July 10th, 2015.